The swirling depression is grumbling in from the Atlantic and will slowly churn up the country from west to east. 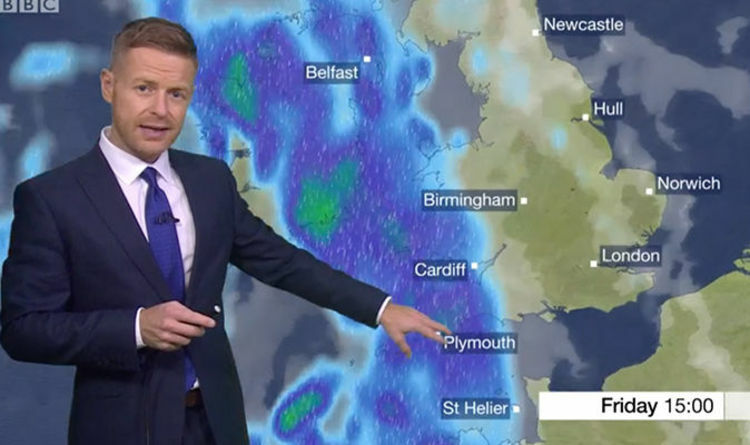 BBC forecaster Tomasz Schafernaker said: “The weather is not looking great for some of us on Friday. “In fact, the Atlantic at the moment is looking very lively - a lot of swirling action going on here. We will see “wet and very windy weather across western areas of the UK - initially, in fact, gale force winds are expected. “Towards the east it’s much dryer temperatures. “It’s this low pressure that will really upset the weather across western areas of the UK - it’s charging in and it’s going to bring gales. “There’s likely to be some disruption. “Through Friday night into the early hours of Saturday the gales and the rain will spread to perhaps some other parts of the country. “Within this band of heavy rain the winds are also very strong, so pounding the coasts of southwestern England, southern parts of Wales. Here gusts could exceed 60 mph and that does mean some potential damage to trees. The Met Office has issued yellow warnings for both wind and rain across the country, meaning some homes and businesses will be flooded and roads will be clogged. Coastal areas should be avoided as spray is blasted inland.